“That’s more like it,” you might have said at some point last night. I certainly did, roughly once every five minutes. As opposed to game one of the Dallas/Nashville series, this game didn’t only provide entertainment for the away fans. Before even looking at stats or heatmaps, I can tell you one thing Nashville improved upon dramatically between games one and two: zone transitions. For the majority of their first contest, Nashville genuinely could not exit their own defensive zone. Last night was much, much better in that regard. Even their attempts to enter the offensive zone (a usual weakness of this team, in my opinion) appeared fast, effective, and dangerous. If you look at the underlying numbers from last night, you’ll find that the team was essentially willed to victory by a handful of extremely effective players. Fortunately for you, I’ve done all the work already. Here’s a look at how each line and pairing performed, as well as a breakdown on Pekka Rinne’s night. All these values are from five-on-five (no special teams included), unless noted otherwise. The forward lines were a little wonky last night after the relatively early exit of Wayne Simmonds, who was on the unfortunate end of a particularly wicked Roman Josi slapshot. The fourth line existed as some combination of Austin Watson, Calle Jarnkrok, Rocco Grimaldi, and Mikael Granlund. Also adding to the wonkiness was the relative lack of five-on-five hockey. There were many, many penalties. All in all, nearly 30% of the game was spent with somebody (usually Dallas) on the powerplay. Still, the usual top three lines did manage to play enough minutes to generate some helpful numbers. Johansen’s line was as productive as always, creating a nice advantage in all categories against essentially every combination of forwards and defensemen Dallas had to offer. Turris’ second line, despite what you might hear around the arena or see on Facebook, continues to be a legitimate possession dominator on the ice. Many helpful folks will point out their relatively empty goal totals. There is absolutely an effect on the overall game of having a line that consistently out-produces its opponents, though. Goals or not, this line is undoubtedly a positive influence on the team performance as a whole. On the other hand, the third line. Nick Bonino, Austin Watson, and Colton Sissons are decent depth players. 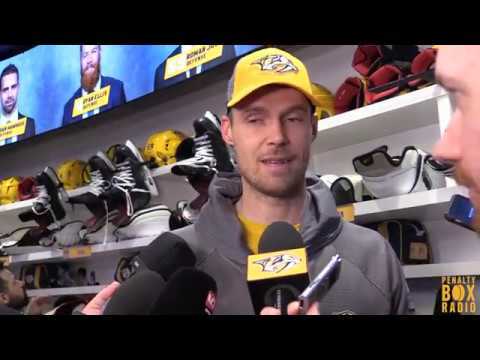 Sissons, I might even say, is a very good depth player. The problem is, Peter Laviolette really, REALLY wants this line to shut down top-tier opposition. In both games of this series, and for most of the season, it has simply not worked. Stop trying to make shutdown happen. It’s not going to happen. The fourth line, as I said, was more of a committee than one trio of players. Still, whatever they managed to piece together down there did pretty well for themselves. As with the forward lines, this game provided yet another example in a recurring theme we’ve seen for most of the year. Roman Josi and Ryan Ellis take the majority of the minutes, Mattias Ekholm and P.K. Subban take the most difficult competition, and the third pairing attempts to sweep up the rest. He also made multiple bad passes while attempting to exit the defensive zone, primarily to his defensive counterpart. Unsurprisingly, many vocal spectators kindly informed all of us that those passes were, in fact, somehow P.K. Subban’s fault. In terms of overall possession though, the pair continued to simply dominate at an eyebrow-raising, if not jaw-dropping level. Dan Hamhuis and Dante Fabbro remain a real highlight of this star-studded defense. Hamhuis makes truly excellent stops at the blue line on a routine basis. Fabbro makes clean zone exits look easy. Their time on ice was affected by all of the special teams, but the pair still produced impressive numbers, especially for a third pairing. Predators fans should rejoice that both players will remain together on this roster next season, barring something unexpected. The Stars’ scoring attempts were somewhat limited last night. Even with a dozen minutes of power play time, they produced 51 shot attempts, 38 unblocked shot attempts, and nine high-danger scoring chances at all strengths. At five-on-five, they were pretty much shut down. Still, Rinne bailed his team out on more than one occasion, especially in the face of some nasty tips right from the crease. His high-danger save percentage could have been slightly higher, but he allowed exactly as many goals as expected. With the skaters in front of him playing like they did yesterday, that should be good enough for the win at least 4/7 times.